Lorraine Collis, our Chief Executive, was one of just five inspirational business leaders to be recognised as a ‘Champion of Change’ at the Women in Business Awards held on Thursday 15th September 2016. The accolade rewards those who have implemented positive cultural change in their working environment. 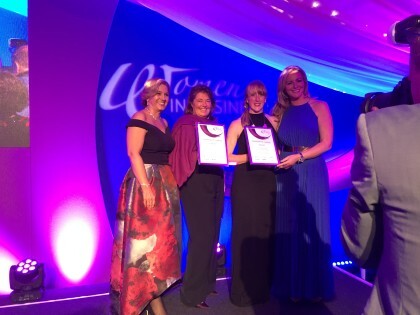 Held at Oakley Hall Hotel in Hampshire, the glittering awards ceremony was hosted by Baroness Mone of Mayfair OBE, Lady Michelle Mone, who also presented the awards. Lorraine joined ELM as Chief Executive in 2011. Lorraine’s strong leadership has cemented ELM’s reputation as a business offering an ethical approach to leasehold management with full transparency for its clients. Services and fees are tailored specifically to each estate that ELM manages, with a one-off management fee, no extra charges and no commissions accepted. ELM also provides assistance with individual requirements, such as Right To Manage and Resident Management Companies. Our leadership team at ELM – made up of more than 70% women – has implemented a progressive business strategy, ‘The ELM Way’, during Lorraine’s tenure. This has delivered a 50% reduction in the number of customer complaints and disputes, and a reduction of staff turnover from 20% to 5% in just over two years.